When conservative Leo Carraway loses his full ride scholarship to Harvard, he is forced to turn to his biological father, punk rock legend King Maggot, for help. Part road movie and coming of age story, Born to Rock by Gordon Korman is a perfect mix of comedy and drama. Manhattan's club scene serves as the background to this witty, romantic tale about finding love, friendship, and yourself in unexpected places. Nick and Norah's Infinite Playlist by Rachel Cohn and David Levithan begins when Nick, hoping to making his ex-girlfriend jealous, asks Norah, "Would you mind being my girlfriend for five minutes?" Please note, the movie and the book are very different. I love them both but the movie takes some major liberties with the book's dynamics. I must confess. Cecil Castellucci is my favorite Young Adult author and this is one of my favorite books. Beige refers to the nickname given to Katy by punk rocker chick Lake when Katy is forced to spend the summer with her father, a punk rock legend nicknamed "The Rat". Lake thinks Katy has no personality of her own. She's quiet, she's polite, she does what she is told. She's beige. Or is she? 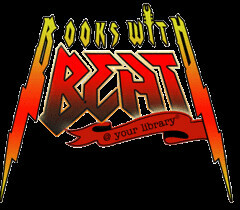 So what are your favorite "Books With Beat"?